Krispy Kreme's seasonal holiday donut menu for 2017 remains largely unchanged with the arrival of the same trio of donuts as last year and includes the Santa Belly Donut. 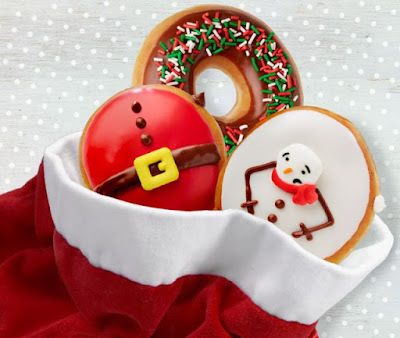 The Santa Belly Donut is a yeast shell donut filled with chocolate Kreme and decorated to look like Santa's jolly belly with a combination of red and chocolate icing plus a candy buckle. - Melted Snowman Donut - A yeast shell donut filled with original Kreme and dipped in white icing. It's decorated chocolate icing and a candy snowman face. - Holiday Sprinkles Donut - A yeast chocolate iced ring donut with holiday sprinkles. You can find the festive donuts at for a limited time at participating locations in the US and Canada.